On 11 October, 139 days after the federal election, the new Belgian federal government took office. This right-wing government, nicknamed “the Swedish coalition” in reference to the parties’ colours (blue for both liberal parties; yellow for the Flemish nationalist party) and ideology (the Swedish cross representing the Flemish Christian democrats), is led by liberal francophone Charles Michel, 38, who became the youngest Belgian Prime Minister for 174 years. This government presents a series of interesting features. Firstly, it only includes one francophone party (the liberal Mouvement Réformateur, MR) compared to three Flemish parties (the liberal Open Vlaamse Liberalen en Democraten, Open VLD; the Christian democratic Christen-Democratisch en Vlaams, CD&V; and the nationalist Nieuw-Vlaamse Alliantie, N-VA). As such, francophone parties are largely underrepresented at the federal level. Secondly, it is one of the most right-wing coalition governments ever formed in contemporary Belgium, excluding both Flemish and francophone socialist parties and the francophone Christian Democratic Party (Centre démocrate Humaniste, CdH), even though the latter was initially invited to be part of the coalition. Thirdly, it is the first time a Euro-critical (or even Eurosceptic) party, N-VA, is included in a coalition government at the federal level. Finally, since taking office, the Michel government had to face major criticisms, dealing with a series of unpopular measures presented in the coalition government as well as the shady past of some N-VA cabinet members. This article explores the context in which the new government has been formed, and highlights the challenges it will have to face in the near future. 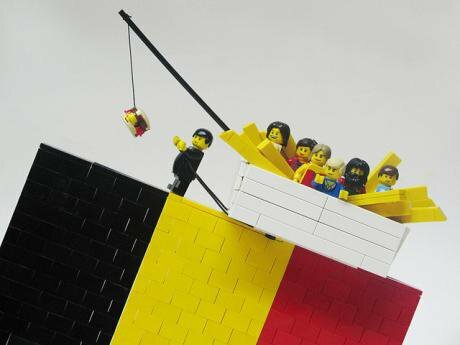 In recent years, Belgium faced major political and institutional crises, which led the country to spend 589 days without a government between June 2010 and December 2011. Following the 2010 general election, which saw N-VA becoming the largest party in the Chamber of Representatives, a potential coalition government seemed impossible to draw. After a long series of negotiations between Flemish and francophone parties, a compromise was then found to have a sixth state reform. Besides a transfer of competences from the federal level to the communities and regions, the most important aspect of this state reform was the decision to split the electoral and judicial arrondissement of Brussels-Halle-Vilvoorde, as demanded by most Flemish parties. The francophone Socialist Party (Parti Socialiste, PS) Leader, Elio Di Rupo, was then sworn as Prime Minister and a traditional tripartite coalition (consisting of all Christian democratic, liberal and socialist parties) took office on 6 December 2011. On 25 May 2014, three elections took place in Belgium, to elect representatives at the federal, regional and European levels. The two largest political parties, N-VA and PS, led aggressive campaigns against each other. Whilst the 2010 election campaign mostly focused on institutional issues, the 2014 campaign was influenced by the so-called N-VA and PS models. In an attempt to convince the francophone electorate not to vote for PS, N-VA Party Leader Bart De Wever even released a video on YouTube where he asks francophone voters to give him “the benefit of the doubt”. As such, it seemed that both parties would not be able to rule together as part of a coalition government. At the federal level, the election results favoured the N-VA right-wing model. On the one hand, N-VA gained 6 additional seats in the Chamber of Representatives (33 compared to 27 in 2010). On the other, PS lost 3 seats (23 compared to 26 in 2010), even though it remained the second largest party in Parliament. All other mainstream parties, besides the francophone Green Party (-2 seats), made substantial gains or remained stable, with Flemish far-right party Vlaams Belang becoming marginal (3 seats, -9 compared to 2010). At the regional level, the situation was rather similar. In Flanders, N-VA was the incontestable winner with 43 seats (+27 compared to 2009), followed by CD&V (27 seats, -4) and Open VLD (19 seats, -4). In Wallonia, PS (30 seats, +1) remained the largest party, but MR (25 seats, +6) made the largest gains while cdH (13 seats) remained stable). In Brussels, PS also remained ahead (21 seats, stable), followed by MR (18, -12) which suffered from the break of its former alliance with the regionalist-liberal party Fédéralistes Démocrates Francophones (FDF; 12 seats). cdH gained 9 seats (-2), becoming the fourth largest party in Brussels. Once the election results announced, Bart De Wever – the leader of N-VA - claimed victory, and was then appointed by Philippe, King of the Belgians, as “informateur” in order to find a suitable coalition to form a federal government. Unlike in 2010, negotiations to form a federal government were coupled with negotiations at the regional level. And that is where things got interesting. Ten days following the elections, and while De Wever was holding consultations with all major parties, the PS leadership quickly started talks to form regional governments in Wallonia and Brussels. It was announced that coalition talks with cdH in Wallonia, and both cdH and FDF in Brussels, will be underway. This came as a surprise to many observers and other political parties, as it was widely expected that federal negotiations would take place beforehand. The following day, N-VA and CD&V reacted by officially starting negotiations in order to form a Flemish government. The goal of PS was clear: by making cdH its main partner at the regional level, the party wanted to isolate MR on the francophone side. When, on 24 June, De Wever send a note to cdH in order to form a potential coalition together with N-VA, CD&V and MR (thus excluding Open VLD and both socialist parties), Party Leader Benoît Lutgen left the table of negotiations on the grounds that there is a lack of trust between the parties. As a consequence, Bart De Wever was relieved of his duties as “informateur”. Future PM Charles Michel succeeded him, after being appointed by King Philippe on 27 June. It quickly became apparent that in order for the coalition to have the require majority in the Chamber of Representatives without socialist parties, the only alternative was to include Open VLD in what subsequently became “the Swedish coalition”. On 22 July, Open VLD was also included to join the Flemish regional coalition government, as this was one of their conditions to join the Swedish coalition. As such, it appears that regional strategies have played an important role in shaping the future federal coalition, which took office on 11 October after three months of intense negotiations. The institutional divide between North and South did not prevail as it did in 2010: instead, two socio-economic models, defended by N-VA and PS, confronted each other and served as basis to form the federal coalition government. Will the Michel government survive? In only two weeks, the Michel government faced major criticisms from political opposition, trade unions and citizen groups. Two main criticisms were raised. First, the 207-page coalition programme includes a series of unpopular measures, such as the plan to raise the pension age from 65 to 67 in 2030. As a result of these measures, Marc Goblet, the secretary general of the ABVV/FGTB trade union, has talked of a “permanent guerrilla campaign” against the government. A demonstration is planned on 6 November in Brussels, followed by a series of regional strikes, followed by a general strike will take place on 15 December. Whilst social dialogue constitutes one of the key features of Belgian politics, the Michel government seems to break with this tradition. Second, two N-VA coalition members, Jan Jambon (Deputy Prime Minister and Minister of the Interior) and Theo Francken (Secretary of State for Asylum, Migration and Administrative Simplification) have been criticized for their declarations on collaboration with the Germans during World War II (for Jambon), for their close ties with former collaborationist Bob Maes and for some older homophobic and xenophobic statements (for Francken). The political opposition and immediately called for their resignation. Both cabinet members subsequently apologised, and PM Michel declared he will not tolerate such situation in the future. In terms of political strategy, N-VA will do whatever it takes for the coalition to survive until the next election, in order to appear as a mainstream party capable of ruling at the national level. In addition, it is likely to see N-VA push for a seventh state reform in the context of the next federal election in 2018, in order to implement their confederal vision of Belgium. In summary, the Michel government will face tough times throughout the end of the year. Nevertheless, an opinion poll released on 12 October (before the Jambon and Francken “scandals”) highlighted the fact that 47 per cent of Belgians trust Michel as Prime Minister, which is 2 per cent more than Di Rupo when he took office in December 2011. With the series of unpopular measures announced in the coalition agreement as well as the series of strikes planned throughout November and December, it is likely to see this figure decline in the short run, especially on the francophone side. The government will also have to face a strong (and mostly united) political opposition in the Chamber of Representatives. Finally, with MR now being isolated on the francophone side, one might wonder whether the francophone “unity” might be affected in the long run, in case a community conflict arises again.